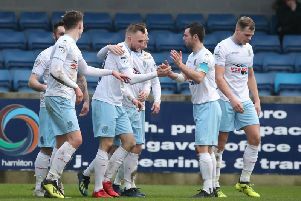 Ballymena United manager David Jeffrey will be looking for his side to pick-up three points when they face Glenavon in the Danske Bank Premiership at Mourneview on Saturday afternoon. The Sky Blues were on a 19 game unbeaten streak before they lost 3-2 to Crusaders on New Year’s Day. That was followed by a defeat to Linfield in the semi-final of the County Antrim Shield, a win over Dundela in the Irish Cup before last Saturday’s 2-2 league draw with Dungannon Swifts at the Showgrounds. The last time United met Glenavon in the league at Mourneview the Lurgan Blues won 4-0 after United’s Andrew Burns was sent-off. And Jeffrey wants his side to prove their mettle tomorrow afternoon. “We were disappointed with the result against Dungannon but we have to dust ourselves down and head towards a massive game against Glenavon. “The last time we played them one decision turned the whole game with the sending off of Andrew Burns and we were punished after that. “But for 60 minutes we were the better side and no-one would argue with that. But after the draw against Dungannon it will be time for a bit of reflection for the players. “They have to realise that they have worked very hard and got themselves into a great position. And the former Linfield boss Jeffrey knows what to expect at Mourneview Park this weekend. “They are a very talented bunch. They are one of the clubs we are aspiring to copy as they were fighting relegation, then they were fighting for top six and they have consolidated their place in the top six. “They have also won a coupe of Irish Cups and that is what we are trying to do, that target and objective has not changed. “And it will be another tough test against a very good side on Saturday,” said Jeffrey. And Jeffrey admits it is good to nearly have all his players fit for the business end of the season. “The only people who haven’t taken part in training are Reece Glendinning and Tom McDermott. But there is one thing not being injured and being match fit. “It’s like Andy McGrory being out since November 23 and he has had one training session - so he is not fit but he is getting there. 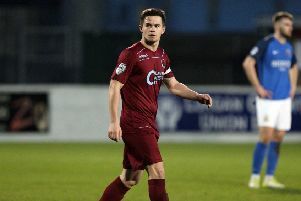 “Leroy Millar was out from Boxing Day but because Leroy is a very fit individual we knew we could get 20 minutes out of him against Dungannon but even he knows he has to get up to speed. “Andrew Burns is another who is coming back. He has had his first training session. They may not be fully fit and they have to regain their match fitness but they are all getting there,” said Jeffrey. And Glenavon manager Gary Hamilton has spoken of his delight after he tied Josh Daniels down to a new contract before this weekend’s clash.. The highly-rated winger, joined the Lurgan Blues from Derry City. “We’re delighted to be able to keep Josh here,” Hamilton told the club’s official website. “He’s a top player and a young lad with a long career in front of him. “He’s an exciting talent who’s done really well.